Sunday, August 3. All three baby robins fledged yesterday. The nest is empty! 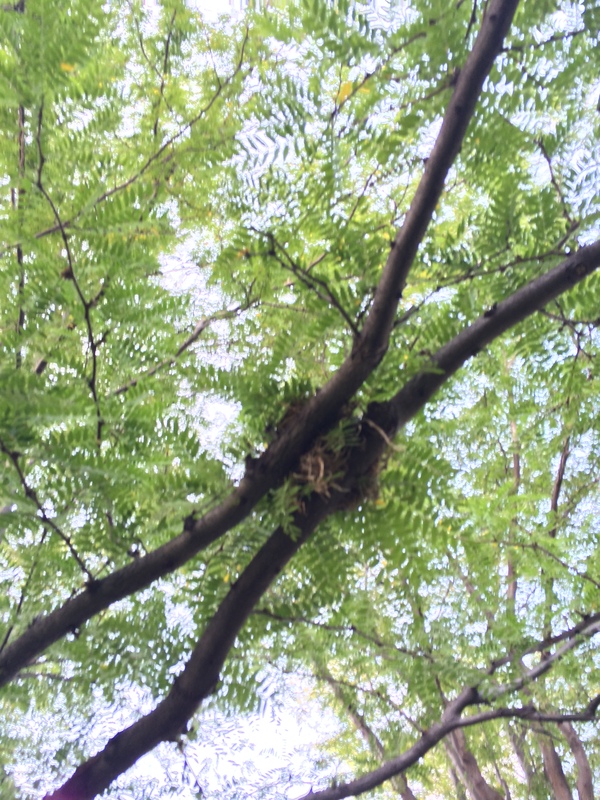 You can see the nest – about 4/5 the way out on the lower limbs of the nearest honey locust tree. 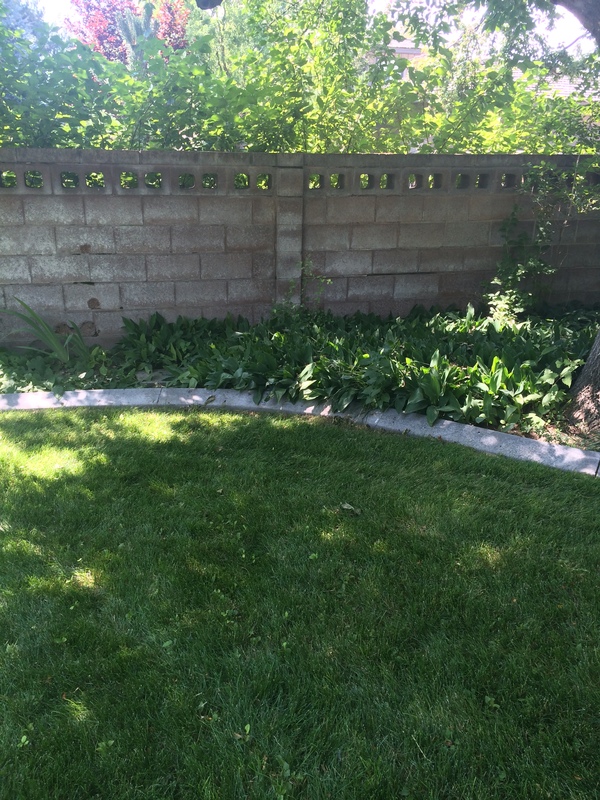 We don’t know where the first robin found refuge, but the second robin hopped into the peony bush next to the bird bath along the left end of the fence and the third bird hopped into the lilies of the valley on the right end (the area behind the hanging pot). Here’s a bottom view of the nest. You see the knot next to the nest? That’s where the last baby bird got caught before she fell. Anyway, maybe feeling a bit of the empty-nest blues after all the excitement of the past week. But I am determined to keep these three baby robins safe! 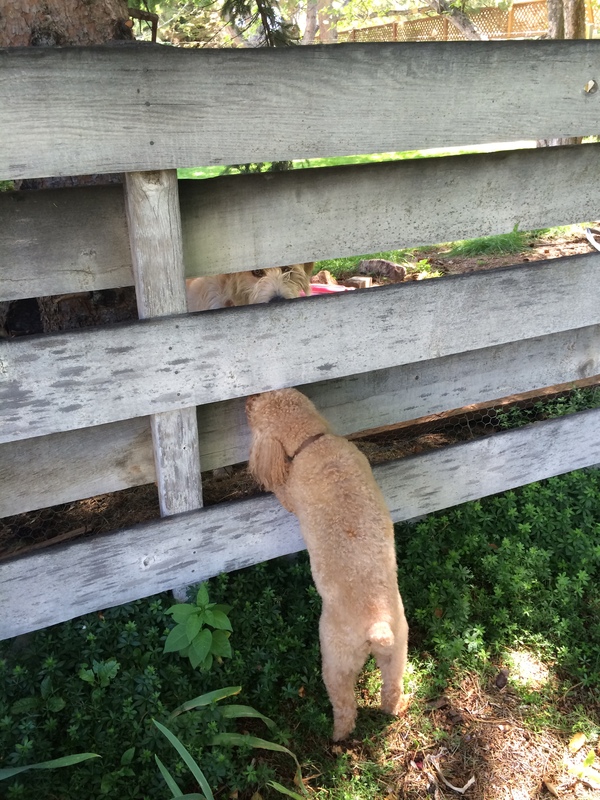 Our back yard is surrounded by three cement block fences so I’m pretty sure the babies are still back there. First order of the day on Sunday, August 3, is to post a sign on the back door to remind all of us – to watch Rudy with the birds! Yeah, well, Little Lord Fauntleroy has a history. I’ll never forget the summer a few years ago when I let him out in the morning to do his business but then he didn’t come back. I called him and finally went out to see what was holding him up. 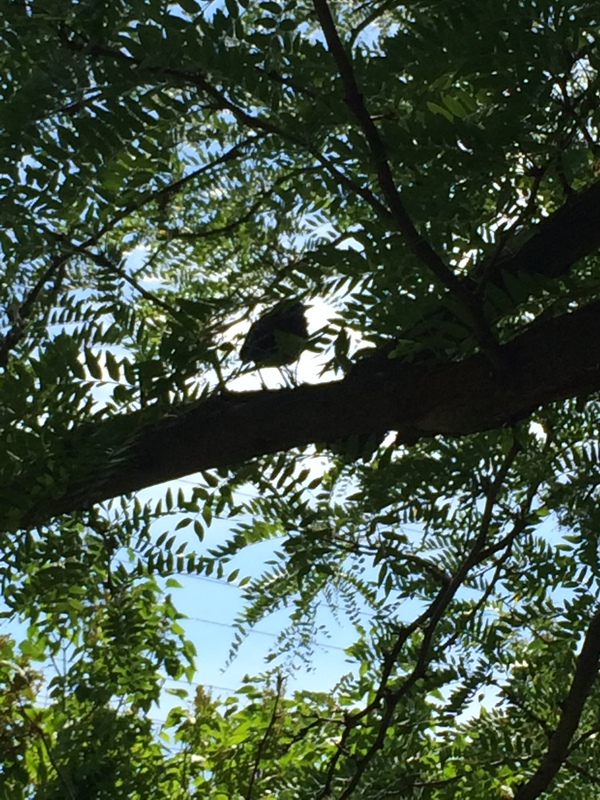 Well, it was a fledgling – in Rudy’s mouth! He was using it as a flip toy, grabbing it in his mouth and then flipping it around. Well, of course the fledging died. But that’s not going to happen to our little bird family this time! 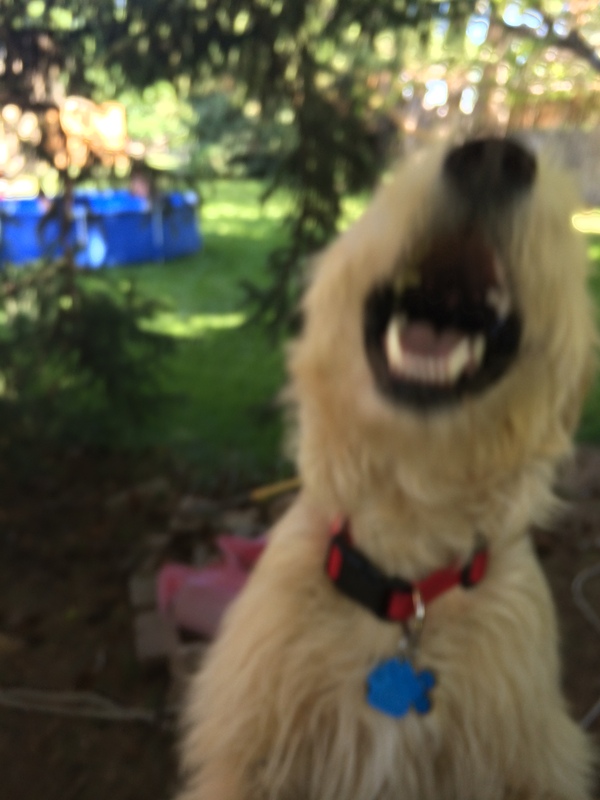 I hear Rudy barking outside – oh-oh. 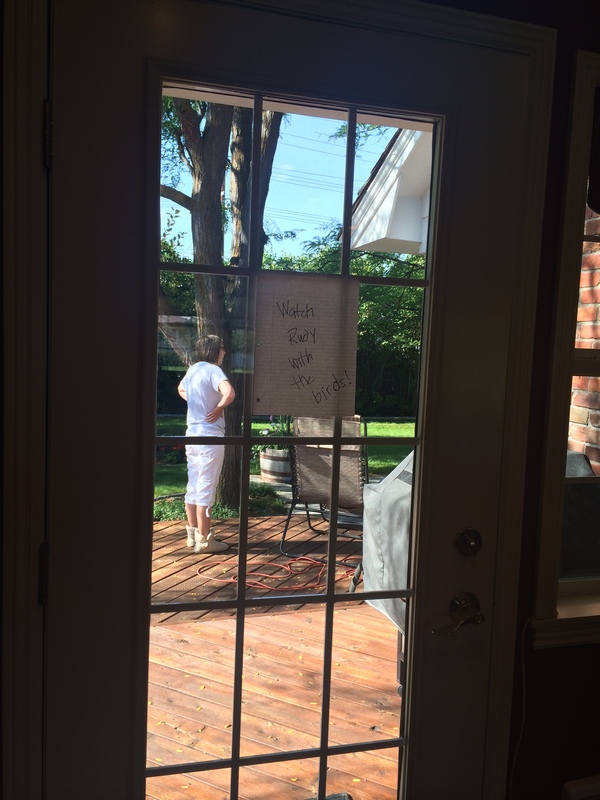 I run to the back door – oh good! Megan is out there policing him. 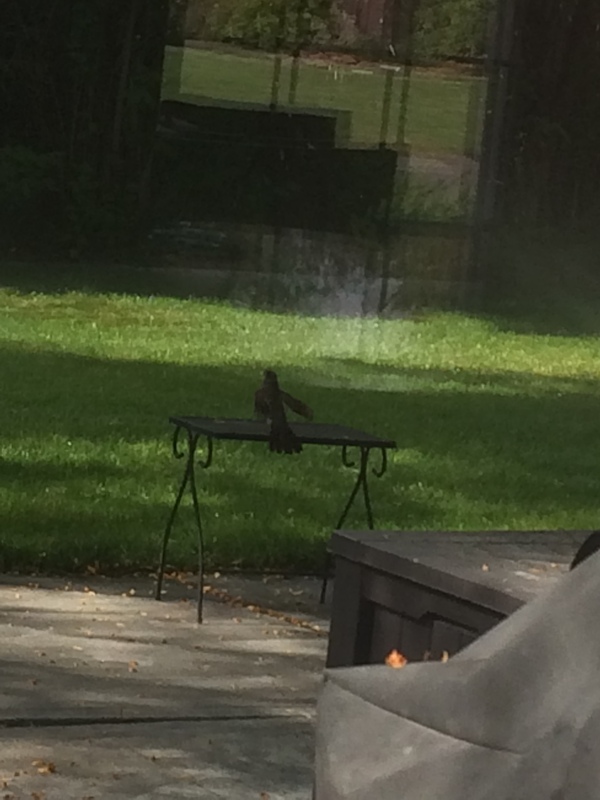 Sunday – the day after the birds have fledged- is hot – 90 degrees again. We see no sign of the babies but we do see busy adults – crisscrossing the trees, sitting on the back fence, hopping in the gardens. Then on Monday, it started raining. A weather pattern of heavy thunderstorms settled over southeast Idaho. By Tuesday noon there were flash flood warnings. Cruel weather for baby birds who can’t fly! Well, the third bird, the little one, the runt, didn’t survive. It was Megan who discovered his tiny little body – sprawled out dead on the sprinkler cover next to the lily of the valley’s – just feet away from where he had initially found refuge. I wonder if he ever did get a worm from his parents after he fletched or had they already abandoned him even when he was a nestling? It rained for four days. The young birds had to be strong enough to hop up onto tree limbs to escape the saturation on the ground. The sun came out again on Friday. We’ve been watching for the babies. 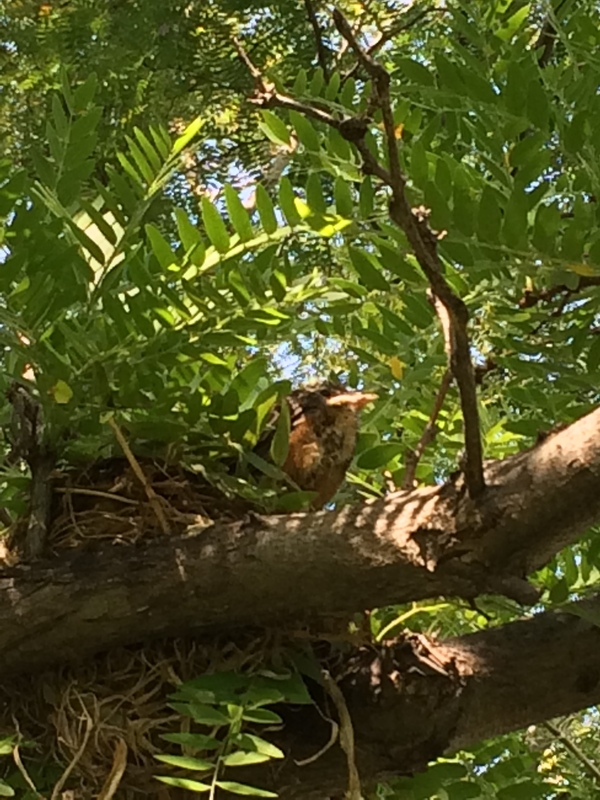 Megan and I are pretty sure we saw one with dad yesterday (the fathers take over training the young birds to fly, forage for food, recognize dangers and roost in trees with other robins). Back along the lilac hedge a speckled young one was hopping about two feet behind the dad, imitating his every move, foraging for bugs. It’s been 8 days since the baby robins fledged. I believe the remaining two have joined the flock now – roosting together in the trees at night and feeding together by day. They will grow stronger over the next few weeks – fill up on fruits and berries to build up their body fat as fuel for migration. Check out this link from the Washington Department of Fish and Wildlife to learn more about robins. Also, in my online search about robins I came upon this incredible robin blog – put together by a bird lover in Kentucky who planted cameras by several robins nests, captured fantastic photos and videos and kept a running day-by-day account of events starting with mom building the nest up to the time the birds fletch. Really cool! Sunday, August 10 – 9AM – present time. I just now had the back door open and heard chirping. I saw two little robins frolicking along the lilac hedge at the back fence. I stepped outside and captured this video. Methinks the babies are doing fine! But did you know that up to 80 per cent of young robins die each year? Only the strongest, and the luckiest, survive and go on to raise young themselves. 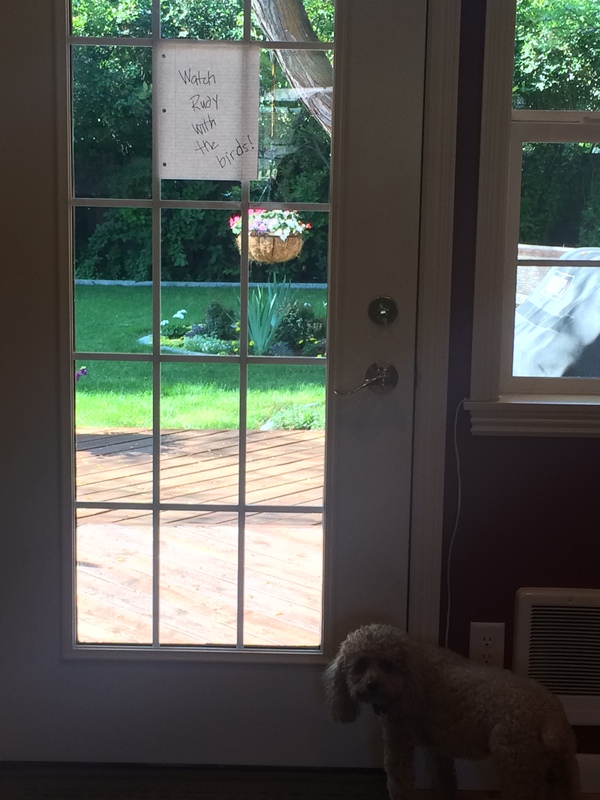 So, I’m keeping the sign posted on the back door to remind us to watch Rudy, you know, in case he tries to turn one of the precious babies into his latest chew toy. It’s just a matter of time before that Frisbee slices the empty nest out of the tree. It’s Saturday, August 2. 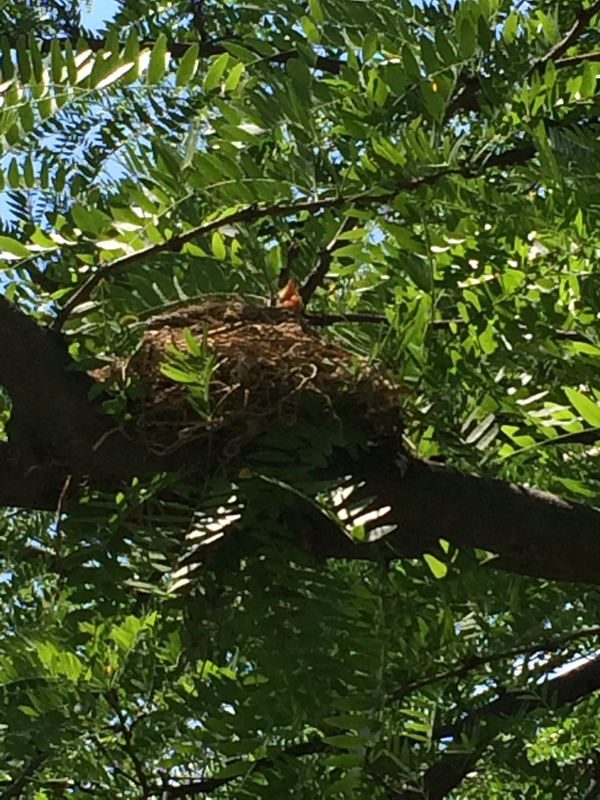 All day we have been watching the robin’s nest in the honey locust tree in our back yard. 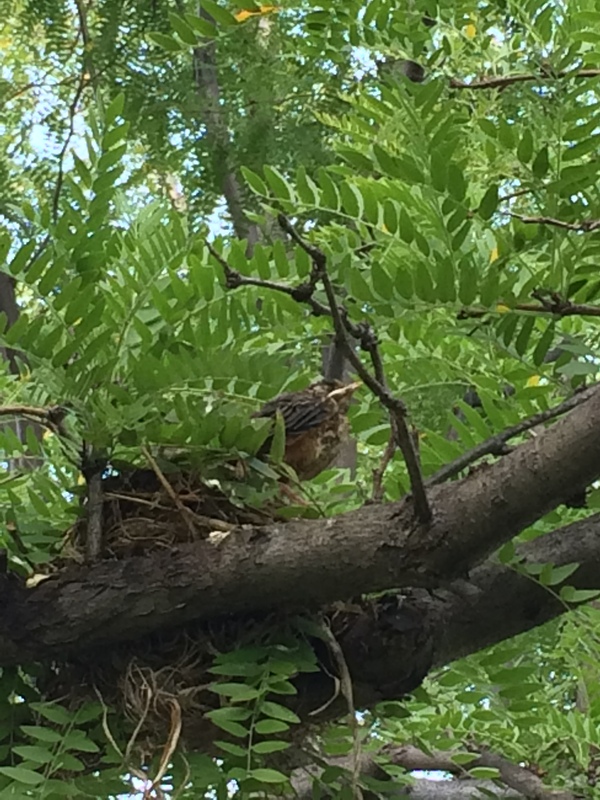 Two baby birds have fletched – left the nest today (that’s what Part 1 of this robin blog is about). It wasn’t until the first two birds were out of the nest that the third bird – definitely the runt- stuck his little beak up. It’s already 2:20 in the afternoon. We have not seen the adult robins feed this little bird today. As far as we could tell, the other two birds got all the feedings, and only when they fledged and were out of the nest completely. So what of this little guy? It would be just hunky-dory for him to stay in the nest for another day or two, get some one-on-one nurturing from mom and dad, don’t you think? Then he’ll be ready! But where are mom and dad? Oh, look at him now! 4:25 PM. He’s up on the edge of the nest! Oh my. He’s so little! He doesn’t have much day left to work his way through this process. 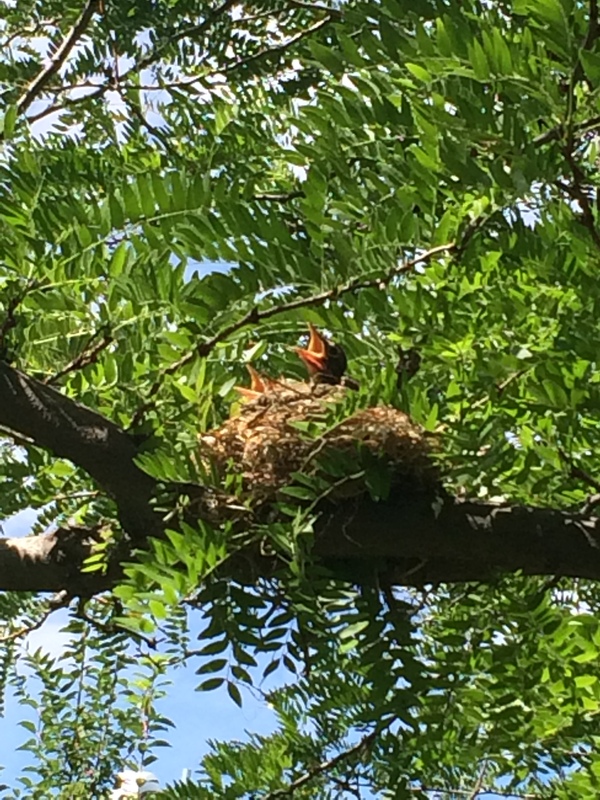 It took the second nestling three hours of exercise to work his way from the edge of the nest to finally jumping off the limb into the grass. We keep checking on the bird. At 5:02 Rudy came out with us. By accident. 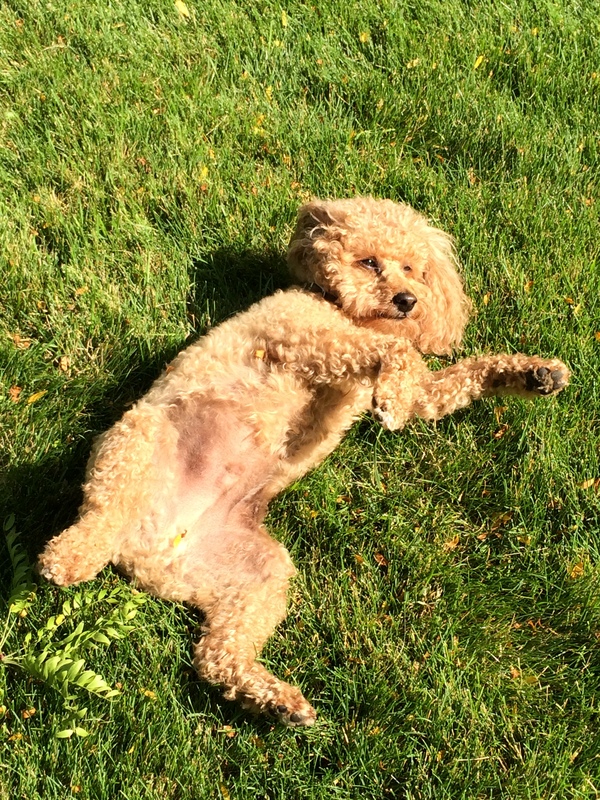 Here he is rolling around in the grass practically underneath the bird. “Hey! Get back in the house!” Megan reprimands him. 5:20 now – the bird has been standing on the side of the nest now for at least an hour. Has he inched away from the nest, just a tiny bit? Does he look like he’s mustering up some courage? The next step is to jump out onto the limb where he can exercise and practice some important skills, and maybe mom and dad will feed him! I went back into the house and for some reason, after another 20 minutes – felt compelled to come out and check on the bird. Megan had been standing watch the whole time. I get under the nest and … oh no! The bird decides it’s time to jump onto the limb. 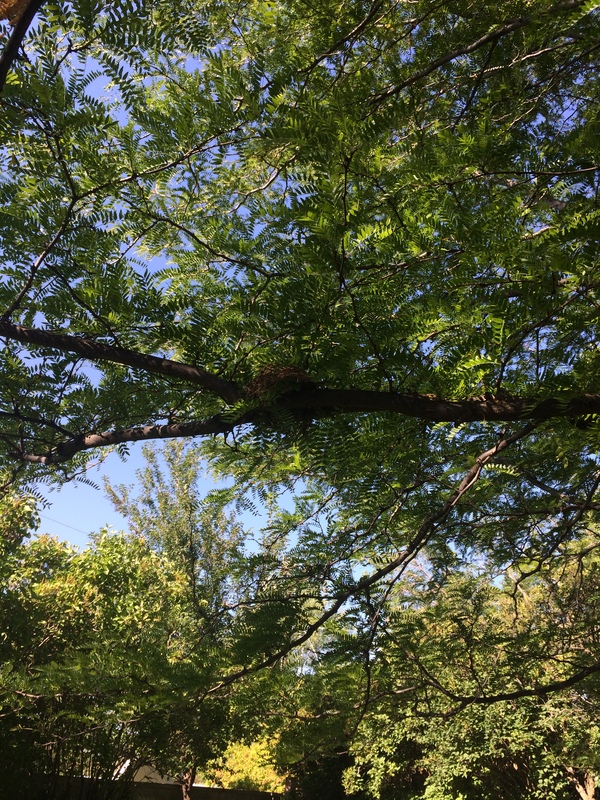 But he stumbles and gets caught between the two limbs that converge under the nest (caught right where that knot is – caught between a knot and a hard spot, you could say). Not pretty. Crap! He flutters his wings and … falls into the grass 8 feet below. Geez! What happens now? He’s so tiny. Is he hurt? I zoomed my camera to capture another photo of him sitting there stunned, where he fell. Suddenly the little bird perked up, and hot-tailed (more of a ‘hop-tail’) it toward our west fence, mustering every morsel of strength he had in him. 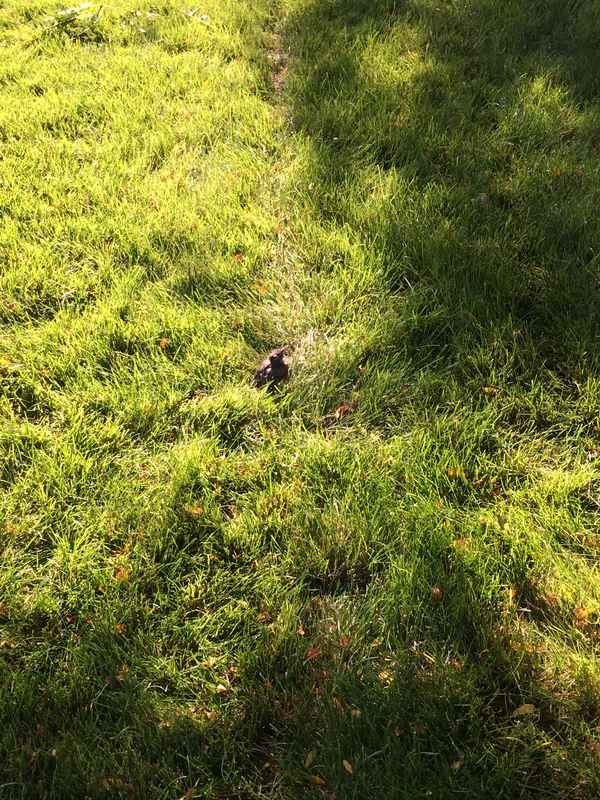 I took a 3-min-45-second video of his journey – it took him that long to make it 30 feet across the grass. I clipped the video so I can post it – the video here starts when he was about half way there and had pooped out. 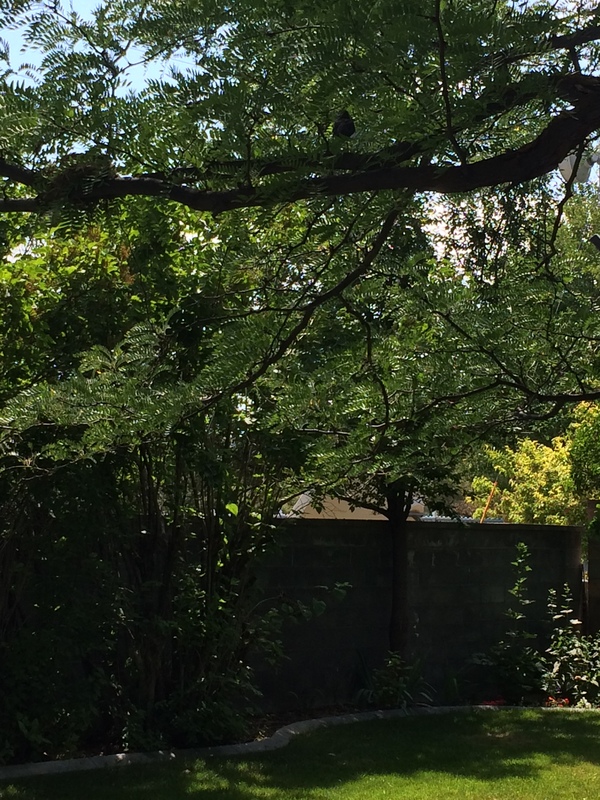 Dad or mom had been perched on the back fence – watching – and swooped down to prod him on …. Do you think he has even a hair’s breadth of a chance for survival? 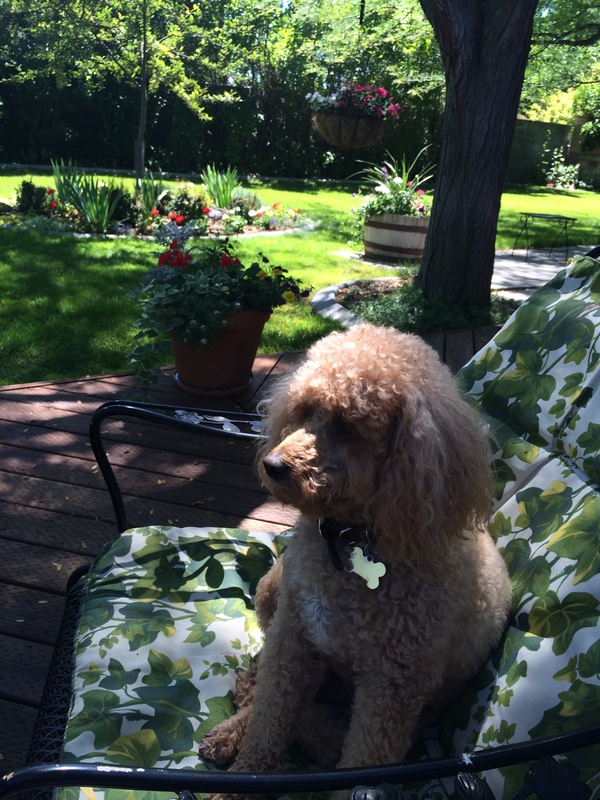 or “Little Lord Fauntleroy” as David affectionately calls him. 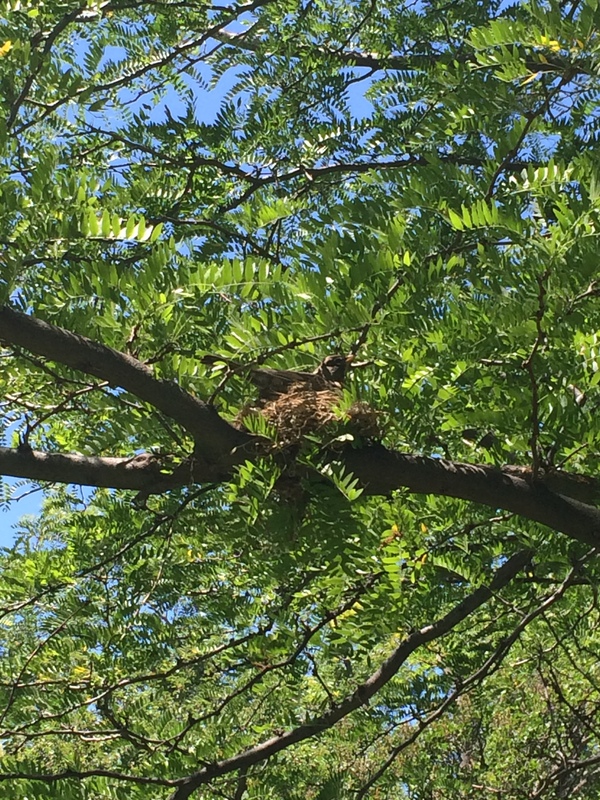 We spot a robin’s nest in one of our giant honey locust trees- with a nesting robin! 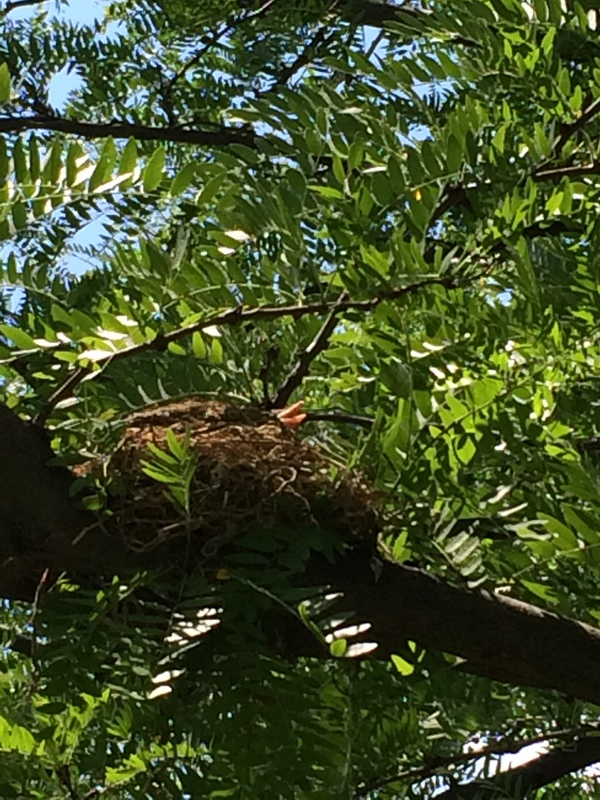 The nest is about 8 feet off the ground, maybe 20 feet from where we are sitting. The next day, Sunday, we discover 2 hatchlings. I keep an eye on the nest all the following week. The weather is hot and sunny – in the low 90’s all week, and the mother is nesting, mostly, I believe to keep the babies cool. In the evening she is off the nest for long periods. The father is always nearby. 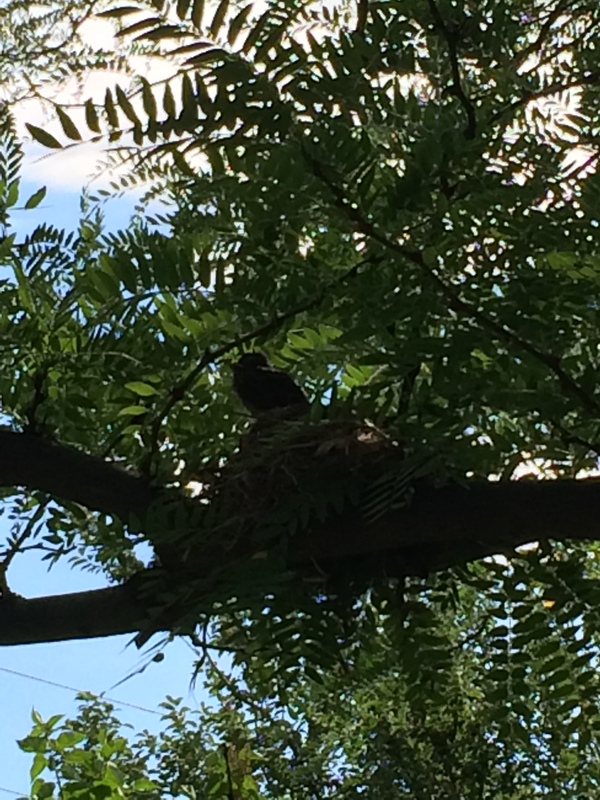 Here he is guarding the nest from above. 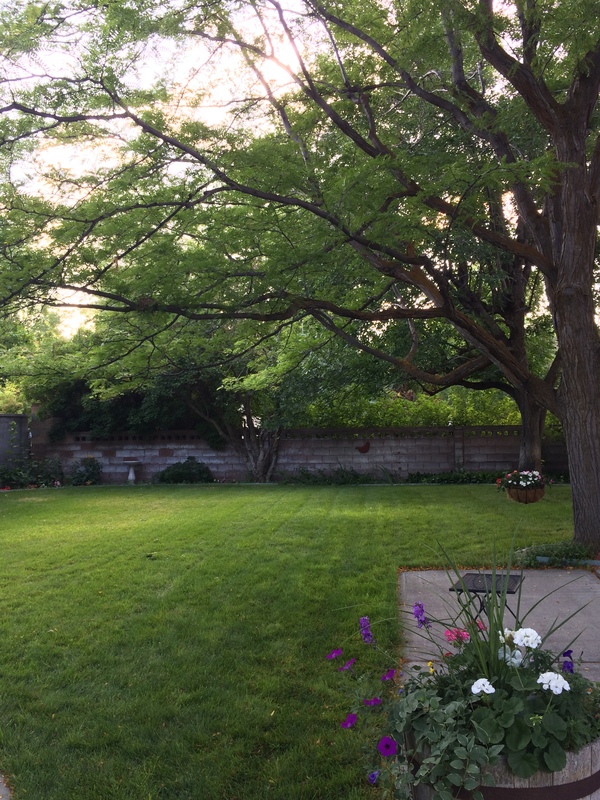 Although this is the safe end of the yard, the Frisbee could just as likely be sailing through the other end of the yard where the robins are nesting. 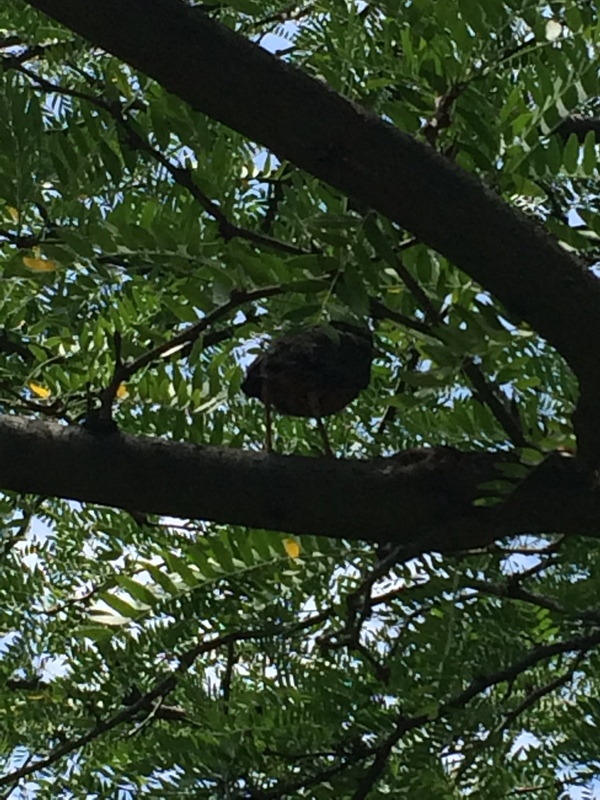 It’s a miracle the Frisbee hasn’t sliced the nest out of the tree already. 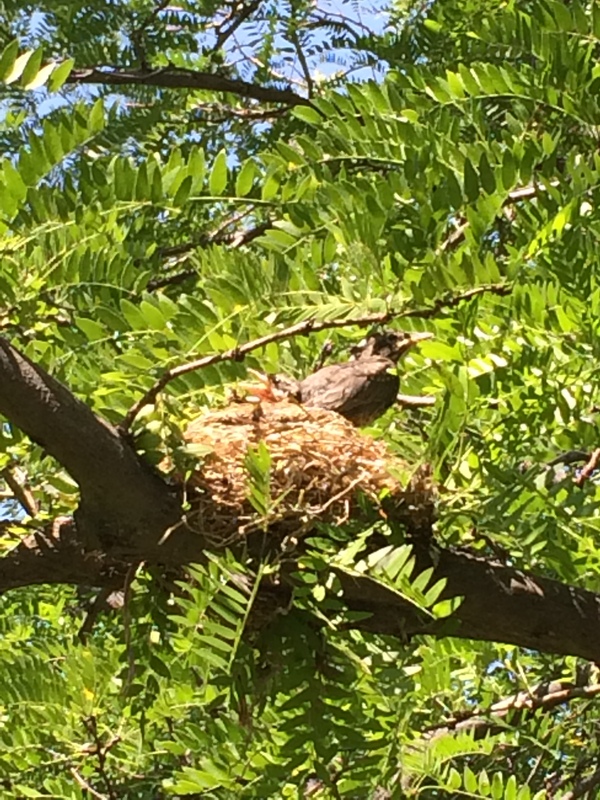 Friday, August 1st, six days after sighting the nest, a big wind swept through our back yard. Okay, so the wind had kinda waned by the time I captured it on video – but the initial blast of wind shot me out of my chair in the den, where I was watching TV, to check on the birds. The wind didn’t even sway the nest, to my surprise. The wind (and Rudy’s bark!) warned of more dangers that lurk to destroy the chances of survival for young robins. It’s Saturday again. 7 days from when we first discovered the nest. 11:45 AM. I am relaxing on the deck – have just opened a book, when a black and white gooey blob of bird poop hits the bulls-eye – right on my head – drips down my forehead. “Wha-the?..” Was that on purpose? 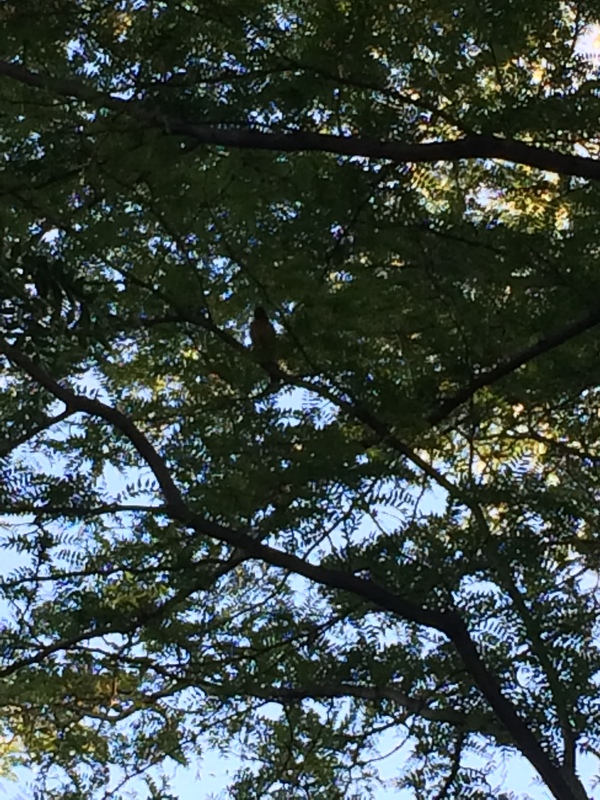 I look for adult robins straight up into the trees above me, but see no visible perpetrators. Wily! Into the house I march to clean up my hair, face, glasses, shirt, and – finally I’m back out again. 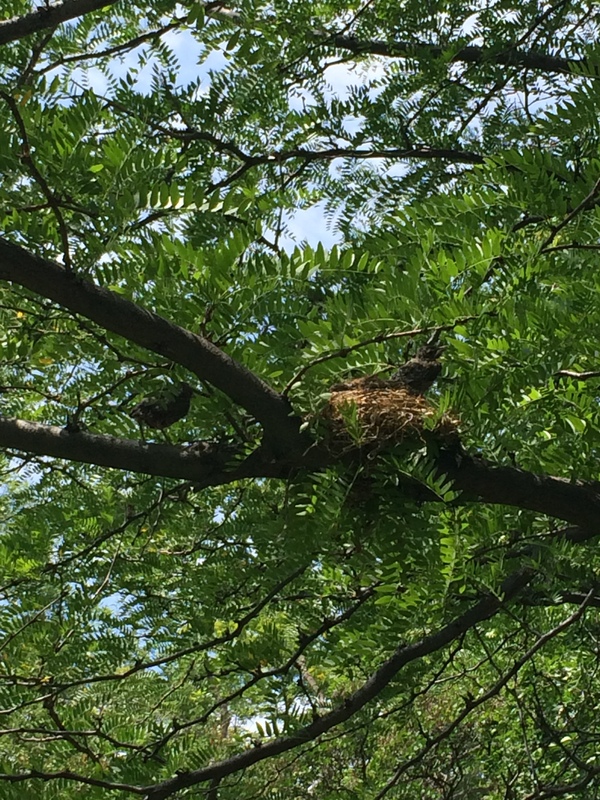 I look over at the nest – one hatchling is perched up on the side of the nest – oh my goodness! The outside temperature is already soaring toward 90 degrees. The mother (or father) comes with food. Which bird do you think gets the worm? We keep watching – It’s 1:15 now. For the past hour, the first fletchling has been balancing, standing, shaking, chirping, pruning her feathers (okay, could be a ‘he’) mustering up the courage to jump! – since the baby birds can’t fly yet. I go off to do something in the house. Return at 2:05 – 50 minutes later. 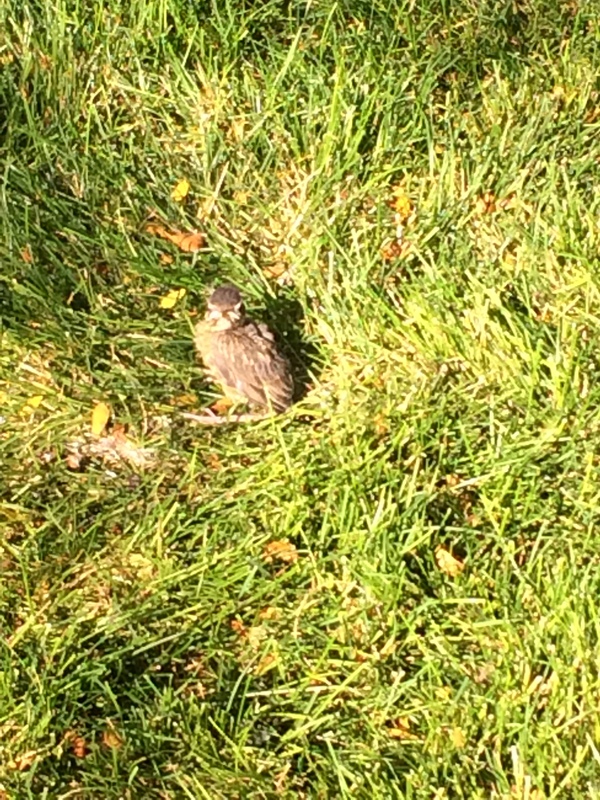 The first fledgling has hopped off and is gone! 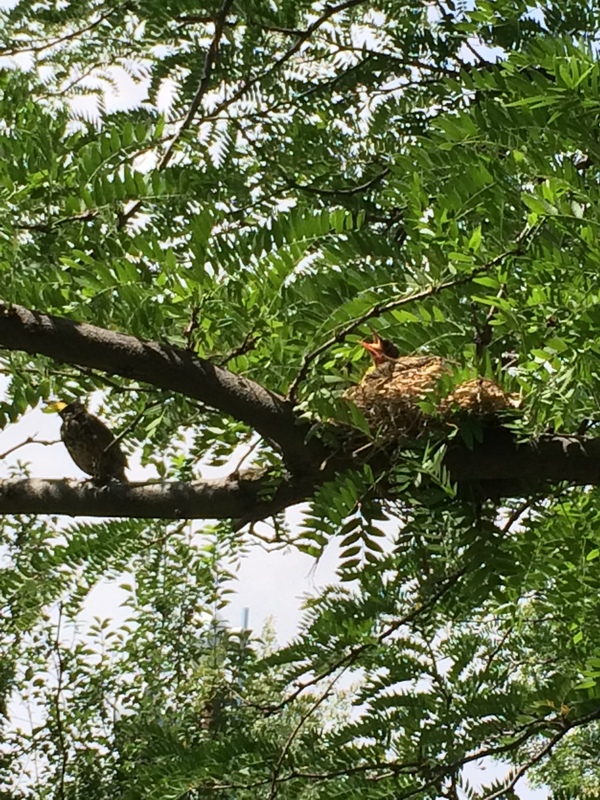 The second fledgling has hopped off the nest and is perched down the limb about six feet away from the nest. The second fledgling stood there for the longest time – preening his feathers, exercising his legs, checking out his balance, chirping, stretching his wings, mustering up all his courage – to jump! His mom or dad came with another worm, too. “You can do it!” they seemed to be chirping at him from not far away. Megan kept watch while I finally went off to do other things in the house. Finally at 3:18 (75 minutes later!) the bird jumped. Megan saw it and called out to me. I ran out and captured it on video just as it hopped to the end of the back yard into the peonies. Meanwhile …. a third beak poked up out of the nest. The runt! I had seen a tiny third beak poking up between the other two – just once in the past week. I thought that bird had died. Hadn’t seen it at all amidst all this other activity. Oh my goodness. Where has he been all this time? He is so much tinier than the other two – surely mom and dad will let him stay in the nest another day or two till he’s ready? He’s a late bloomer. Probably got bullied in the nest by the other two all along. He just needs a little time to catch up. What do you think? Does he stay or does he fledge today? …. 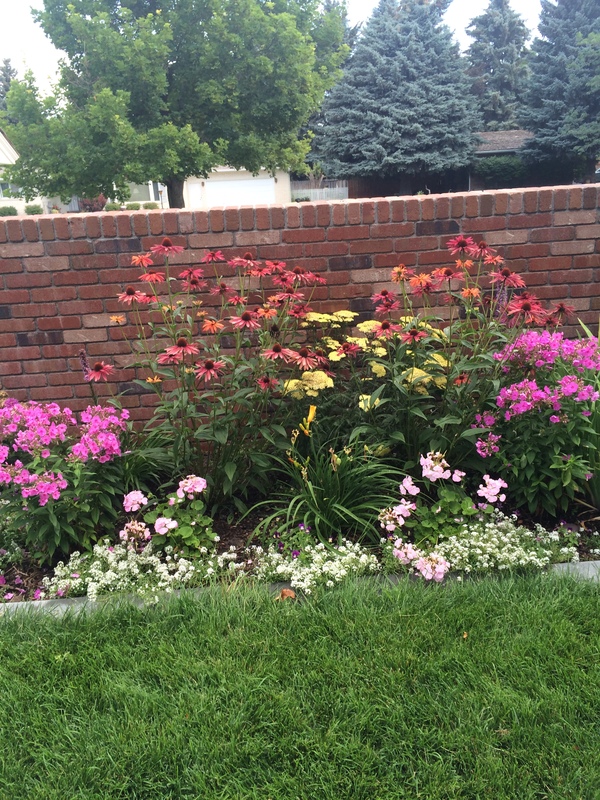 Summer in Idaho! 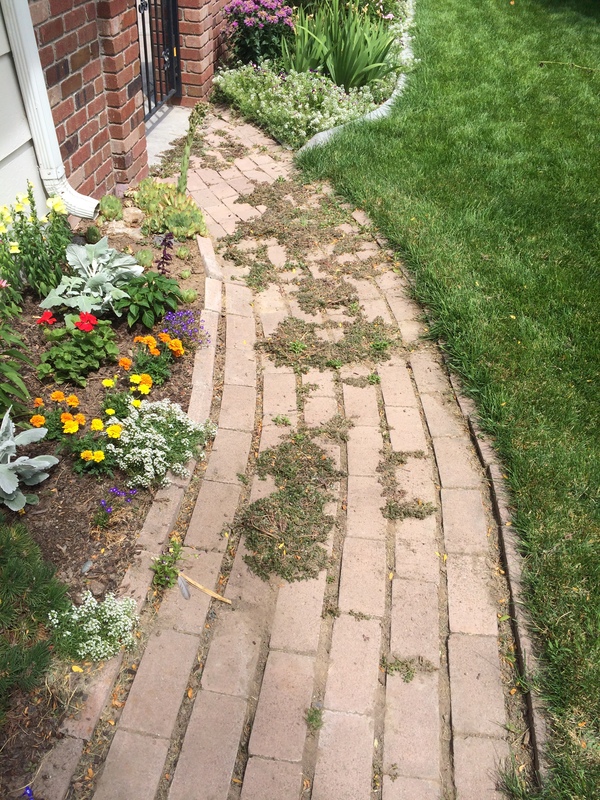 At our house David takes care of the lawn and I take care of the flower gardens, the tomatoes, and the lettuce patch. Except, this year we don’t have tomatoes or a lettuce patch. Last year all our tomatoes caught a fungus; even the tomato plant in a pot, in direct sun, on our deck, which I only watered at the roots – got a fungus. It was completely frustrating, pissy, and ridiculous. I refuse to apply a fungicide, so I’m just not doing tomato plants this year. (1) Pay attention to ALL the details on the plastic tab that comes with the plant: what it is, how hardy is it, how wide and tall it will grow, how much sun it needs, etc. (This exercise can be difficult for a person with ADHD). 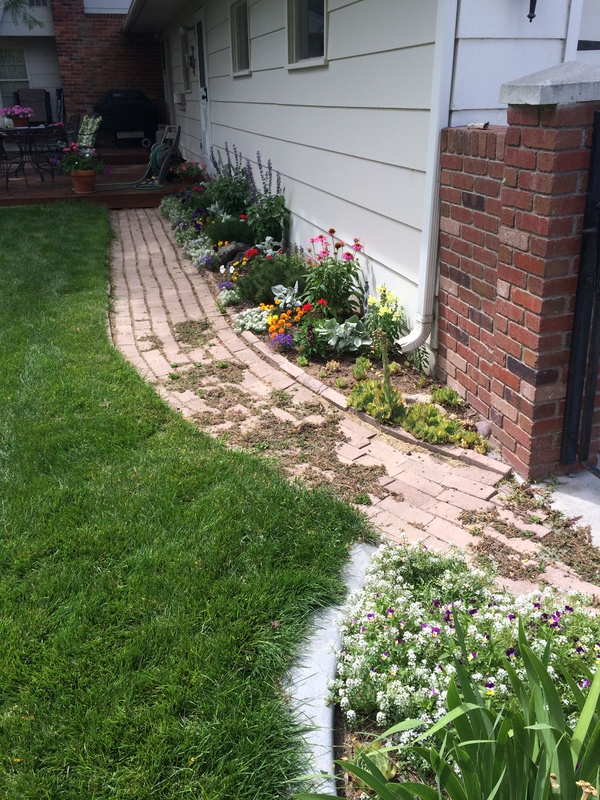 This helps you decide if, and (just as importantly) where you should plant each flower. (2) Save the tab from each plant for future reference in case you want to buy more or to help you know what you have coming up again in the spring. You could simply shove the tab in the ground next to the plant you’ve just planted, or do what I did, place all your tabs together in a ziplock bag, which you then store in a very safe place, so safe that you never find it again. In early spring, when you don’t recognize anything coming up besides dandelions, limit your time looking for the bag with these useful tabs to half a morning, while assuring yourself that you will likely find it again when you decide to move. Hollyhocks: They are a funny flowering plant. Funny, in that you are not laughing when you see them growing wild in groves along desolate roadsides, but try to propagate hollyhocks to annually sprout up and bloom in a designated spot in your garden! 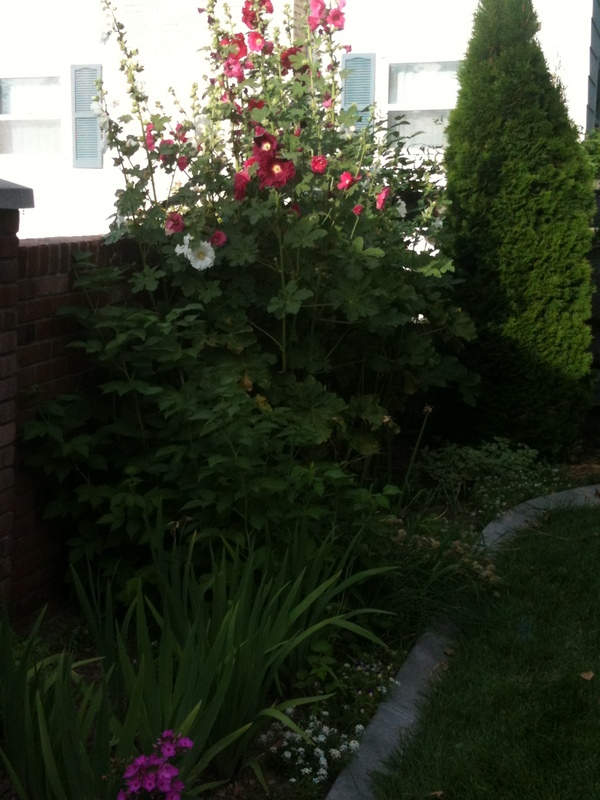 I do have a perfect spot for hollyhocks – or so I declared last year, where this crop sprung up and bloomed. But then this year nothing came back. No hollyhocks? What the hock, I mean, heck? 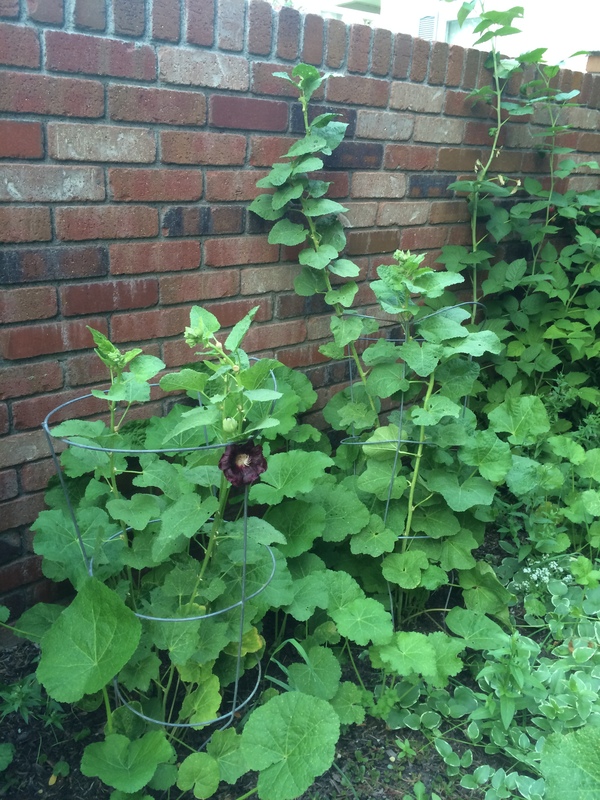 Turns out, hollyhocks are a bi-annual – that is, the first year they come up from seed as low leafy plants, the second year they come up again with budding stalks that bloom in late July into August. Then they die. Period. Our holly-hock patch is not going to be big on blossoms this year. But maybe next year? Another not-laughing funny thing about hollyhocks is that they don’t like to be transplanted. The two plants from the nursery sat there completely frozen in shock for about six weeks, then finally sprouted pencil-thin stalks with buds, stalks that won’t stand up. Thank goodness I had some extra tomato cages lying around. 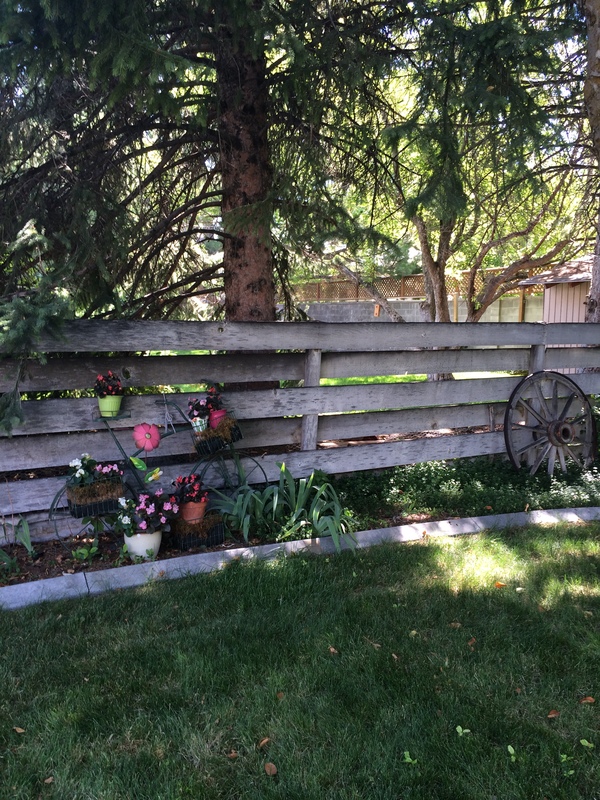 I encased the hollyhocks in the cages to keep the blossoms off the ground (and out of harm’s way of the evil mower). belting out the “Because I’m Happy!” song. (The biggest flower is a gigantic metal fake?) I felt the spot here along the fence needed something. David says the whole thing is an eye-sore, why do I even waste my time? I tell you why. 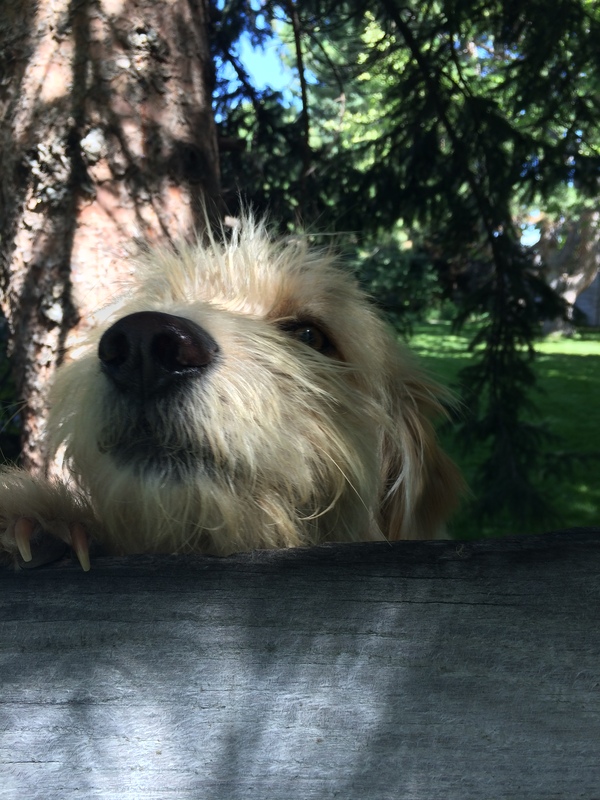 Because a couple times a week I have an excuse to visit that end of the yard, check on the flowers, see if they have water, see if a pest hasn’t devoured them, flowers and all, etc., and … see what the neighbor’s new rescue dog, Einstein, is up to. 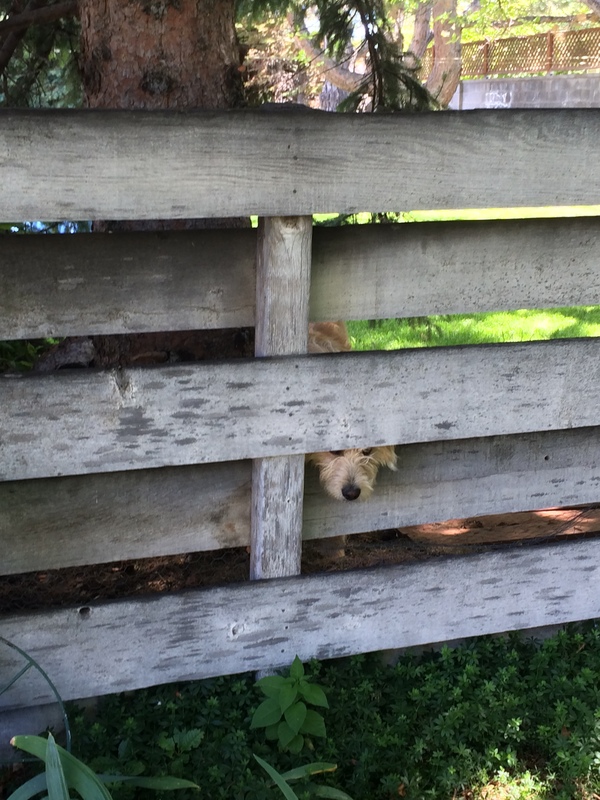 Sometimes he peeks through the fence. 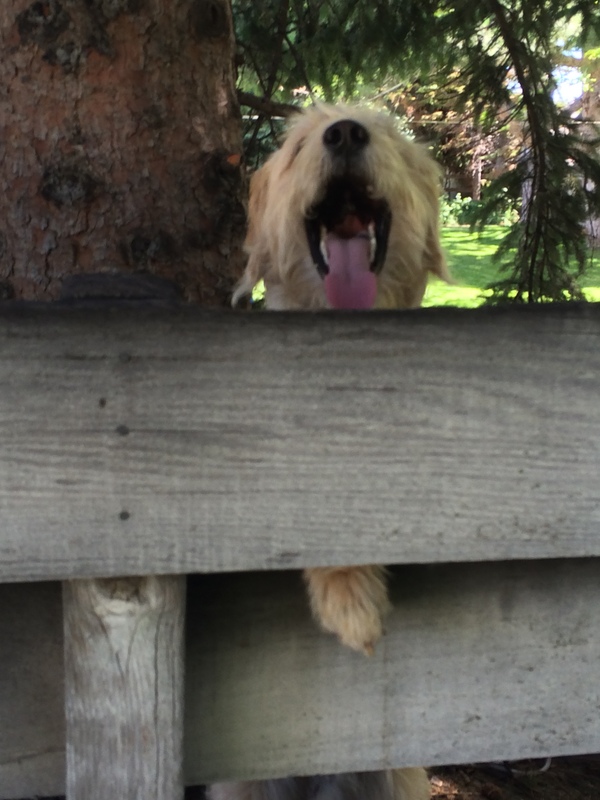 Sometimes Rudy races to the fence, barking like a maniac at Einstein. Einstein doesn’t make a sound. I have honestly never heard him bark. That’s okay. Rudy does enough barking for the whole neighborhood. I thought I could get it all out of this walk without using round-up. So far the pig weed is winning. 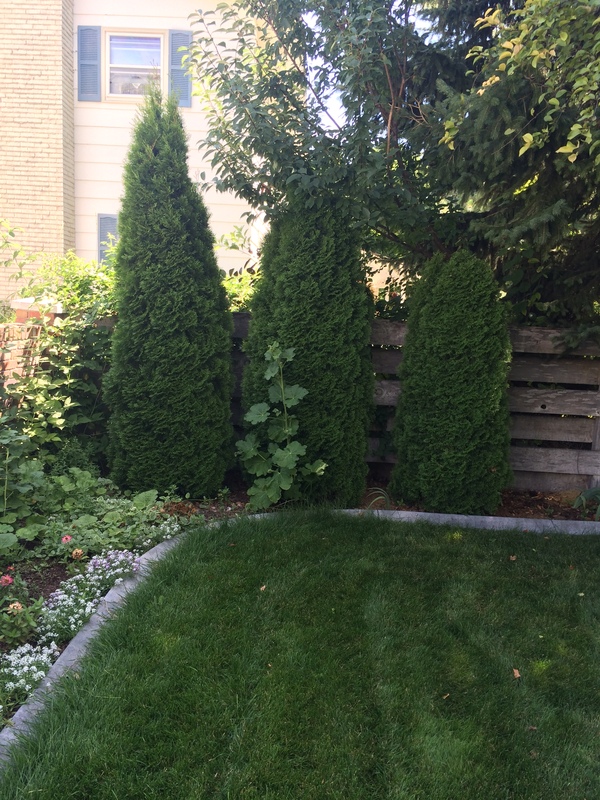 I’m sure I could find lots more gardening tips to share with you. What? Everyone else on the block grows countless juicy fat tomatoes? And every variety of lettuce for their salad, and all the fresh veggies that go on top of the lettuce, too? Awwwww. You suppose I should maybe take up, say, knitting as a new summer hobby? You are currently browsing the The Decompression of a Boomer blog archives for August, 2014.